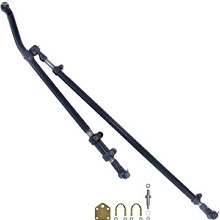 The Currie Currectlync® heavy duty tie rod and drag link system for TJ, LJ, XJ, and MJ vehicles features, a 1-1/4" diameter forged alloy drag link, and 1-1/4" solid alloy steel tie rod bar that is bored and threaded on the ends. All 7/8" thread tie rod ends with boots are included as well as the Currie heavy duty steering stabilizer bracket. This unit is a direct replacement for the stock parts. No modifications or machining to any part of the vehicle is necessary. This unit is rated at 200% stronger than than the stock part.